OK, it is likely that none of us can lead an absolutely perfect worship service, but I am confident that we can get close to or approach perfection in the way we lead our worship. It starts with having your heart and the hearts of your worship team right with God. But there are also some positive thing you can do to help make your worship service powerful and close to perfect. And we recognise that worship might look different for different churches, but that does not mean that we should not aim for being perfect! So if you are a worship leader, and if you want to increase your skills and start to lead a church service that affects the lives of those listening and singing, then this is a great podcast for you to tune into! As a worship leader for many years, I can tell you that there is nothing quite like leading a service where the Holy Spirit takes off and draws people to the throne of God in an incredible and supernatural way. It is one of the great thrills of serving the King, and if we can learn how to lead services like this, not only will we feel fulfilled but people will flock to be a part of it! Leading worship is a journey for us, and discussions like this can lead us deeper into the Lord, and deeper into our skillset as a worship leader. So guys, do not miss this podcast, even if you think (and you are right) that our feeble efforts could never produce the perfect article in our worship. If we can become closer to perfection in our worship leading, it is definitely worth the journey! Check it out now! 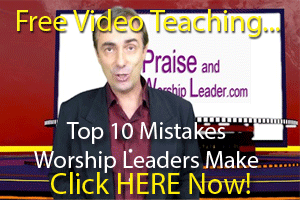 How would you like to lead the perfect worship service? Can we Lead the Perfect Worship Service? OK, it is likely that none of us can lead an absolutely perfect worship service, but I am confident that we can get close to or approach perfection in the way we lead our worship. It starts with having your heart and the hearts of your worship team right with God. But there are also some positive thing you can do to help make your worship service powerful and close to perfect. And we recognise that worship might look different for different churches, but that does not mean that we should not aim for being perfect! So if you are a worship leader, and if you want to increase your skills and start to lead a church service that affects the lives of those listening and singing, then this is a great podcast for you to tune into! As a worship leader for many years, I can tell you that there is nothing quite like leading a service where the Holy Spirit takes off and draws people to the throne of God in an incredible and supernatural way. It is one of the great thrills of serving the King, and if we can learn how to lead services like this, not only will we feel fulfilled but people will flock to be a part of it! Leading worship is a journey for us, and discussions like this can lead us deeper into the Lord, and deeper into our skillset as a worship leader. So guys, do not miss this podcast, even if you think (and you are right) that our feeble efforts could never produce the perfect article in our worship. If we can become closer to perfection in our worship leading, it is definitely worth the journey!